Like molecules, cultural landscapes are all around us, unnoticed for the most part. Cultural landscapes, however, aren't invisible to the naked eye. They're made up of miles of farmland, roads, buildings, and railroad tracks--all highly visible, but often ignored. "A cultural landscape is the tangible evidence or tangible result of the interplay between humans and the natural world," explained Elise Wheeler, who will be hosting a workshop about cultural landscapes on Jan. 12. "It's basically everywhere. It's roads or telephone lines. It's not just the pretty things. It's everything that makes up human interaction with nature." HEARST CASTLE'S INDIANA JONES : Elise Wheeler, archaeologist and president of the SLO County Historical Society, will lead a workshop about Cultural Landscapes on Jan. 12. # The National Park Service has divided these landscapes into four categories: historic sites, designed historic landscapes, historic vernacular landscapes, and traditional cultural properties. A historic site can apply to anything from the property of a president's house to a battlefield, while a designed historic landscape signifies a space that was deliberately organized by a gardener, architect, or horticulturalist--like the gardens at Hearst Castle. Historical vernacular landscapes include the patchwork of houses and farms visible from Los Osos Valley Road. Traditional cultural properties include settings like Chinatown, areas particularly bound to people's heritage and culture. The distinctions between each--while initially difficult to comprehend--are significant, in that they can be used to determine which areas merit preservation. The idea for a local workshop explaining the nuances and importance of cultural landscapes came about when Wheeler agreed to give a lecture to the volunteers that manage the gardens at Dallidet Adobe. She was scheduled to speak for a mere half hour, but her audience was so enthusiastic that the lecture lasted for several hours. The workshop on Jan. 12 will span four and a half hours, incorporating a PowerPoint presentation. Attendees who aren't members of the SLO County Historical Society have to pay $25 for admission--but since that's the same price as an annual Historical Society membership, non-members may do well to simply purchase the membership and attend for free. Wheeler, in particular, has an interest in seeing the number of Historical Society members increase. She has been involved with the board for the past two and a half years and is currently serving as president. In addition to the group's stated goal of studying and preserving the area's history, Wheeler has made it her personal goal to increase the group's professionalism and raise its profile. But the source of her knowledge about cultural landscapes--while useful to the Historical Society--comes from more than 40 years of involvement with archaeology. She has worked with State Parks for the last decade, primarily from San Simeon, where she's based. "Archaeologists also study the impact of humans on the landscape," Wheeler explained. "I personally became very involved with this because I worked for State Parks at Hearst Castle." About four years ago, State Parks commissioned the Olmsted Center for Landscape Preservation to provide a cultural landscape report for Hearst Castle. To facilitate this effort, Wheeler attended lectures about cultural landscapes, reading what she could find on the subject. Anyone with only a vague impression of what a cultural landscape report might be would do well to attend the workshop, where Wheeler's friend, Laurie Matthews, will discuss the various management tools used to preserve and maintain cultural landscapes--one of which is a cultural landscape report, which is a thorough documentation of the stages of change a particular landscape has gone through. Wheeler plans to tackle misconceptions, such as the idea that buildings are cultural landscapes. They are, in truth, only part of that landscape, a fact that bears important implications for would-be preservationists. "There's a really heavy movement now towards preservation--let's save this building, save that building--but we're not looking at what's in between. We're not looking at the setting," Wheeler said. "Setting is what cultural landscapes are about, in part. The context in which each historical feature occurs is as important as the feature itself." Another fallacy is the idea that cultural landscapes are pretty. Some are, while others, like the freeway, fall short of creating a pleasing picture. To drive home the workshop's assorted facts and definitions, Wheeler has organized a presentation featuring local landscapes that illustrate everything she and Matthews are discussing. The ultimate purpose is to guide the inexorable march of progress by determining which landscapes merit preservation. As Wheeler points out, they all tell a story, a sort of photo album documenting humanity's brief history on Earth. That album is constantly changing--particularly the vernacular landscape. In the North County, fields have been transformed into vineyards. That's not necessarily a good or bad thing, just an indication of change. But it's important that the people who have the power to alter these landscapes are fully informed. That's why the Historical Society invited the SLO City Council and members of the city planning staff to attend the workshop. "Landscapes are something that evolves, and that's okay," Wheeler concluded. "We don't want to create a landscape around 1910 because landscapes are dynamic. Things are going to change. That's a given. But hopefully the tools that we have for studying cultural landscapes will help us guide these changes in a way that's positive for everybody concerned." 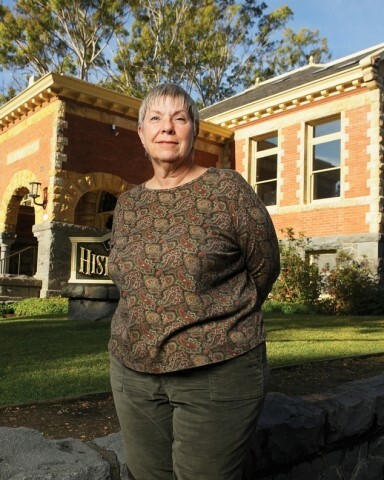 On Jan. 12, Elise Wheeler, an archaeologist and president of the SLO County Historical Society, will present a workshop about Cultural Landscapes from 8:30 a.m. to 1 p.m. in the public room of the SLO County Historical Museum. Admission to the workshop is free for Historical Society members and $25 for non-members. Incidentally, $25 is also the cost of an annual membership to the Historical Society. Space is limited, and anyone interested in attending should RSVP to 543-0638 before Jan. 7. The museum is located at 696 Monterey St., across the street from the Mission. For more information, call 543-0638. Arts Editor Ashley Schwellenbach envisions garden gnomes in her future landscape. Send fragrant flowers to aschwellenbach@newtimesslo.com.